Keep those prying eyes out of your communications and prevent unwanted people from reading your private files ! Private Security - Invisible Secrets 4 hides your private data into innocent looking files, like pictures, or web pages. It also features: strong encryption algorithms; a locker that allows you to password protect certain applications; a password management solution and a real-random password generator; a shredder that helps you destroy beyond recovery files, folders and internet traces; the ability to create self-decrypting packages; secured password transfer. 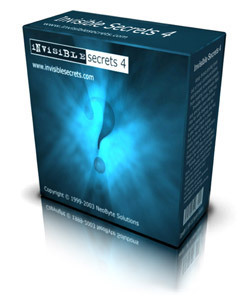 Invisible Secrets 4 hides your private data into innocent looking files, like pictures, or web pages. The ability to create self-decrypting packages, secured password transfer. Internet Accelerator - Accelerates any Windows internet connection in seconds. Advanced ZIP Password Recovery - Zip Password Recovery program recover (break) lost or forgotten passwords for a ZIP PKZip WinZip archives. Spyware Doctor - one of the most popular adaware spyware software on the market. Add Remove Plus 2004 - perfect add remove program designed for all windows.